LaNelle Edwards Looper passed away on Friday, November 23, after a long illness. 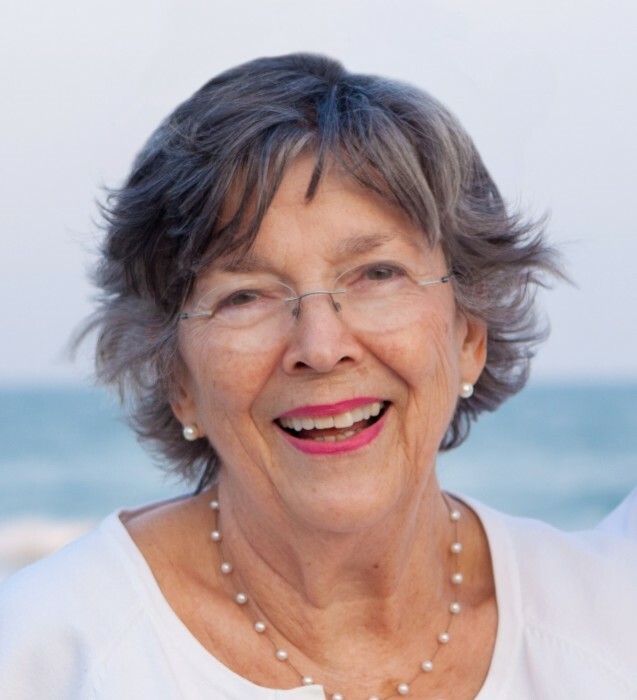 She was known for her friendliness, genuine compassion for others and being a loving mother and grandmother. The axiom, “she never met a stranger” truly described her warm, extroverted personality as she enjoyed life with great enthusiasm for engagement with people. Born on February 22, 1932 to Marion Wilson Edwards and Wyoma McLamb Edwards, LaNelle was an avid learner and graduated from Goldsboro High School (Goldsboro, NC), St. Mary’s College (Raleigh, NC), and Duke University (Durham, NC), where she earned degrees in both zoology and medical technology. Throughout her educational years, LaNelle loved singing and harmonizing, and participated in choirs at each institution, including the Duke Chapel Choir. She met her future husband Byrd (Charles Burdine) Looper at Duke and they married in Goldsboro on May 28, 1955. Combining brains with beauty, she finished her final lab exam in the morning and married in the afternoon. LaNelle and Byrd, then a Marine stationed at Cherry Point Marine Air Station, began married life at Atlantic Beach, North Carolina close to her childhood home in a beach cottage built by her parents in 1939. She worked as lab technician at the Morehead City hospital and they weathered three memorable hurricanes in their first four months of marriage. After the birth of their first daughter, Lisa, at Cherry Point and Byrd’s Marine retirement, they moved to Raleigh, North Carolina for Byrd’s business career start and where LaNelle continued as a lab technician at Dorothea Dix Hospital. Later, the family moved to Atlanta, Georgia, where daughter Lesley was born. In Atlanta, LaNelle made and maintained many friends through church, the choir, scout leading and was active in a tennis league. After LaNelle and the family moved to Selma in 1967 when Byrd was hired by American Candy Mfg. Co. as sales manager, she became involved in a variety of activities over the years. At First Presbyterian Church (now Cornerstone), she sang in the Chancel Choir and became involved in the Women of the Church, and later in the church’s Meals on Wheels program. She expanded her volunteer work into the community volunteering at the hospital as a Candy Striper, assisting at blood drives and singing in the Selma Civic Chorus. She also served as a Girl Scout Troop Leader, a Girl Scout Cookie Coordinator and was energized by tutoring literacy at the former Byrd Elementary. Over many years she helped with local fundraising for the March of Dimes, the American Cancer Society, and American Heart Association. LaNelle found great pleasure playing tennis and bridge and the friendships built through those engagements. LaNelle and Byrd actively enjoyed the Selma Country Club where dances were a highlight, and they cherished a monthly supper club. Together they frequently traveled to Durham to participate in many Duke University alumni events, including returning to support the scholarship they funded, reunions, building campaigns and sporting events. It was a point of pride that both daughters and granddaughters chose to attend Duke. Singing the “Messiah” in the Duke Chapel was particularly memorable for her. Also, an animal lover, LaNelle cared for numerous cats and dogs over the years, including a Himalayan cat Charlie for 19 years that she disarmingly named after her husband. Travel was another keen interest and she relished trips throughout the US and abroad. Most dear were annual trips to Atlantic Beach, North Carolina where she spent summers as a child and made her first home with Byrd. The family initially continued this beach vacation tradition driving from Alabama and then from around the country as her daughters and grandchildren moved to different states. Preceding her in death is her husband, Byrd. She is survived by two daughters, Lisa Looper Jorgens (Craig) of Orinda, California, and Lesley Looper (George) of Morrisville, North Carolina. She is also survived by granddaughters, Laura LaNelle Jorgens of New York City, and Emily Caroline Jorgens of San Francisco, California. Her brother, Marion Edwards, lives in Goldsboro, North Carolina. Diagnosed with breast cancer in 1999, LaNelle was a proud survivor and was grateful to the Duke University Hospital for her treatment. However, Alzheimer’s was a disease that could not be beaten. The family deeply appreciates caregivers Mary Nelson, her daughters Latoya and Lashondar, and Sharon Woods, for their loving care of LaNelle throughout her illness. In lieu of flowers, donations can be made to Cornerstone Presbyterian Church, the Alzheimer’s Association (https://www.alz.org/), or the Duke Chapel Choir (https://chapel.duke.edu/worship/music/chapel-choir).